Are You Ready to Retire Wealthy? Does retirement from job also means retirement from earning? Well, if you don't make the right plans today, then your retirement may mark the ending to your earning as well. This calls for the immediate need of understanding how you can make yourself financially ready for your retirement. Whether you are 25, 30, 40 or 50 years old, you know that sooner or later, retirement from job is certain to be in your platter. That is why, when you are busy planning your life, retirement plan should be the first in your to-do list and you must not procrastinate it. You should feel more motivated to think seriously about your post-retirement financial security after witnessing the following data inputs from an UN report. Before, we talk about retirement, let us imagine a simple and usual life of a person. How Much Money You Will Need After Retirement? Let us assume that post your retirement, you are back to being yourself and your spouse as it was when you were 30 years old. Assuming, your kids are now financially independent. 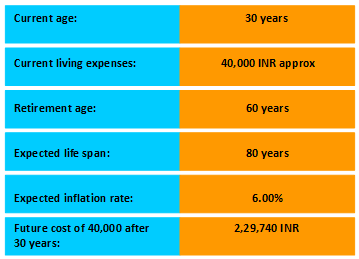 So, at the age of 60, your actual cost of expenses as on today will be 2,29,740 INR per month instead of 40,000 INR per month. 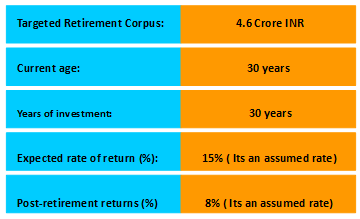 Now, if you calculate your retirement corpus for 20 years (i.e from the age 60 to age 80), it will be approximately 4.6 Crores INR, considering 8% post-retirement returns on your investment. So, have you planned how will you retire with Rs. 4.6 Crores ? The good thing is you can retire as a really wealthy person. Awareness is the key secret to this. Once you receive proper consultancy or advise on retirement solutions, you will have the clear path of what you should be doing to have a dream retirement. 1. Fix the Goal for Your Retirement Corpus: Before you start investing for your retirement, you must fix the goal amount for your retirement corpus. Based on your expense habits, earning capacity, expected income growth, inflation rate, return rate on investments, future needs and future liabilities, you must decide the rough amount for your retirement corpus. Let us consider the aforementioned assumptive calculation, and set your targeted retirement corpus as 4.6 crore. Next you need to work towards achieving it. 2. Start Saving Early Through SIP: This is the best advise that anyone can give you. The advantage of saving early is that you get more years to benefit from the power of compounding and secondly, you can accumulate sufficient corpus even by investing in small amounts. Let's see if SIP can help you in achieving your retirement corpus of 4.6 Crore. SIP is a concept and not a name of any scheme. Mutual Fund Investments are subject to market risks, read all scheme related documents carefully before investing. 3. Stay Informed About Investment Plans: The market has various retirement plans that can provide you a systematic way of investment and wealth creation. You need to get a proper insight about these plans and based on your retirement goals and savings capacity, you must start investing on these plans. It will ensure the achieving of the desired retirement corpus and will also help you in your current tax savings. 4. Do Proper Tax Savings: If you earn good but spend all, then one way you are not saving anything for your future and also, you are paying extra from your income through tax deductions. Thus, it is important to make investments in a way that can minimize your tax deductions. 5. Asset Allocation: Each of your investment is an asset. As you know, certain investments are subject to market risk but offers good returns like Mutual funds and some are not risky such as PPF, but offers less returns. Thus, asset allocation let you properly diversify your investments (assets) so that you can have a balance of risks versus rewards. Asset allocation is an important factor in determining your returns from different investments. Retirement can be your golden time. It can be the time, when you are done with all your responsibilities and all free to invest the time on yourself. You can go for vacations, make more family visits, work for some social cause, and all that you desire. But you will need lots of money to do all these. 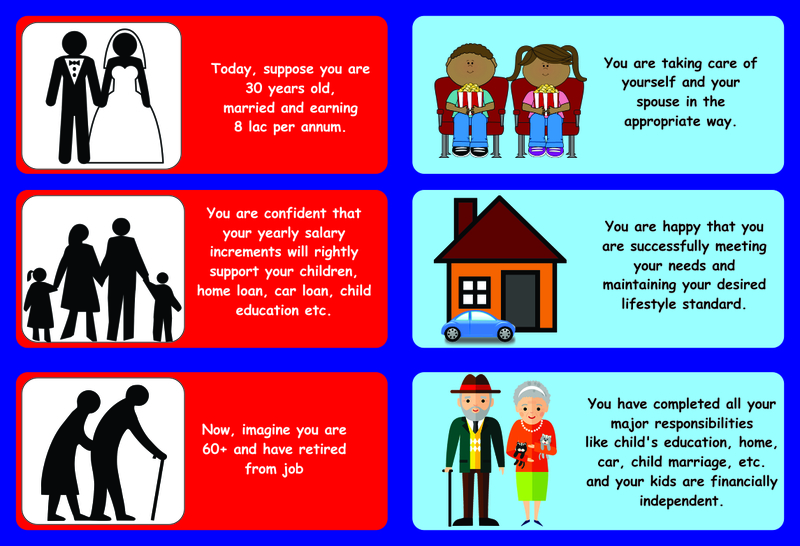 So, owning money will be equally important when you will be 60 as it is today, but at 60 you won't have your job the way you have it today. Therefor, without delay start your financial planing for retiring rich.